Arngrim's father, Thor Arngrim, was a Canadian-born Hollywood manager. Her mother, Norma MacMillan of Vancouver, BC, was an actress who provided the voices for characters as Casper on Casper the Friendly Ghost, as Gumby on Gumby, as Davey on Davey and Goliath, and Sweet Polly Purebred on Underdog, as well as other animated children's programs. Her brother, Stefan Arngrim was also a child actor, perhaps best known for his role as Barry Lockridge on the Irwin Allen science fiction ... See More television series, Land of the Giants. Arngrim has claimed that her brother sexually molested her from age six until nine. After beginning a career as a child model and actress in television commercials, Arngrim rose to fame as a child star in 1974, portraying the role of Nellie Oleson on the NBC television series Little House on the Prairie. She originally auditioned for the role of Laura Ingalls, and later, Mary Ingalls, but was instead cast in the role of antagonist, Nellie Oleson. Arngrim would play the role of Nellie for seven seasons and her portrayal became a cultural reference and camp archetype for the spoiled "bad girl" throughout the 1970s. Years later, in one of her stand-up routines, Arngrim described playing Nellie on Little House on The Prairie as "like having PMS for seven years." In 2002, she was honored by the Young Artist Foundation with its Former Child Star "Lifetime Achievement" Award for her work as a child actress on Little House. At the 2006 TV Land Awards, Arngrim tied with Danielle Spencer ('Dee' on What's Happening!!) as the "Character Most in Need of a Time-out" for her role as Nellie. 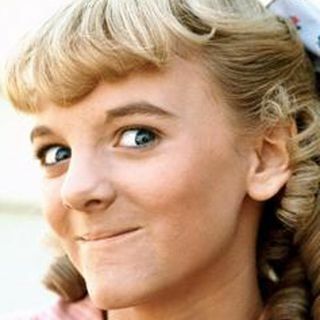 In addition to her role on Little House, Arngrim also recorded the comedy record album, Heeere's Amy, in which she portrayed first daughter Amy Carter. Her mother, who voiced the Kennedy children on the comedy albums of Vaughn Meader, also guest starred on the album. After leaving Little House, Arngrim appeared in guest-starring roles on such television series as The Love Boat and Fantasy Island. She was also a frequent panelist on the short-lived NBC game show Match Game-Hollywood Squares Hour.Arngrim was briefly married to a writer, Donald Spencer, in the late 1980s. On November 6, 1993, she married her second husband, musician Robert Paul Schoonover, whom she met while volunteering at AIDS Project Los Angeles, where he was director of the Southern California AIDS Hotline. Bride, groom, and the wedding party all wore black tuxedos with bare feet and black toenail polish to the wedding. Arngrim and Schoonover live in Los Angeles. Arngrim regularly keeps in contact with her childhood friend Melissa Gilbert, who played Laura Ingalls on Little House on the Prairie. She occasionally appears at Little House on the Prairie reunion events and autograph shows.